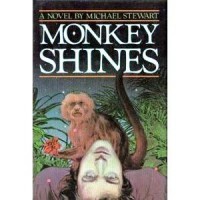 I read this with my Shelfari reading group and I appreciated this old school 80's horror story. An athletic super star suddenly becomes paralyzed from the neck down and his life is forever changed. It is changed once again when he is provided with a helper monkey, which he trains to help him out in daily life. From there the story becomes a bit warped and a lot more interesting. I loved the character development and the pacing. (I am a fan of slow burning stories, so the pacing might not be fast enough for some.) I felt that the dread and tension were sustained throughout the novel and made for compelling reading. There was also a subtext here about animal testing and secret intentions of government entities-this subtext posed questions that are valid to this very day. The ending was the only portion of this book that I had a problem with. Everything was tidied up so nicely that it wasn't quite believable for me. For that I deducted one star. This was an enjoyable, quick read that I would recommend to horror readers that appreciate 80's horror with a slow burn.